Charter schools have outperformed traditional public schools in both cost-effectiveness and return-on-investment (ROI) metrics according to a new report by the University of Arkansas’ Department of Education Reform. A national team of researchers, as part of The School Choice Demonstration Project, began studying over the course of a few years which type of public school delivered the most ­academically cost-effective education. The report, publicly released on April 2, examined schools in eight major cities: New York City, Atlanta, Boston, Denver, Houston, Indianapolis, San Antonio, and Washington. The authors found that in all eight cities, public charter schools outperform traditional public schools in both math and reading cost-effectiveness. They also were ahead in standardized test scores despite receiving less funding per student. A charter school is a public school that is independently run and “receives greater flexibility over operations in exchange for increased performance accountability,” according to the National Charter School Research Center. State laws and charter contracts provide schools with autonomy over curriculum, personnel, budget, and schedule. Charter schools, like regular public schools, are not allowed to charge tuition. The authors described how in New York City, students in charter schools scored roughly 12 points in reading on the 2015 National Assessment of Educational Progress (NAEP) for every $1,000 invested in those schools, whereas students enrolled in the city’s traditional public schools scored about 9.5 NAEP reading points with the same amount invested. For math, the numbers were similar: “More than 13 NAEP points per $1,000 of funding for charters compared to almost 10.5 points for traditional schools,” the authors wrote. In Washington and Indianapolis, charters were 67 percent and 65 percent more cost effective than traditional public schools respectively. Charter schools also delivered a greater lifetime ROI in all eight cities. For every dollar invested in a student enrolled in a traditional public school, they secured $4.41 in lifetime earnings. But the same dollar invested in a student from a charter school yielded $6.37 in lifetime earnings, the report found. “Public charter schools’ ROI exceeded that of traditional public schools by an average of 53 percent. Atlanta charter schools yielded an ROI that was 102 percent greater than traditional schools. Indianapolis came in second, with charters’ ROI 73 percent greater than traditional schools, followed by Washington charters at 58 percent and Boston charters at 53 percent,” the authors said. Education Secretary Betsy DeVos recently touted a charter school for soaring into the top academic performing schools in Tennessee. 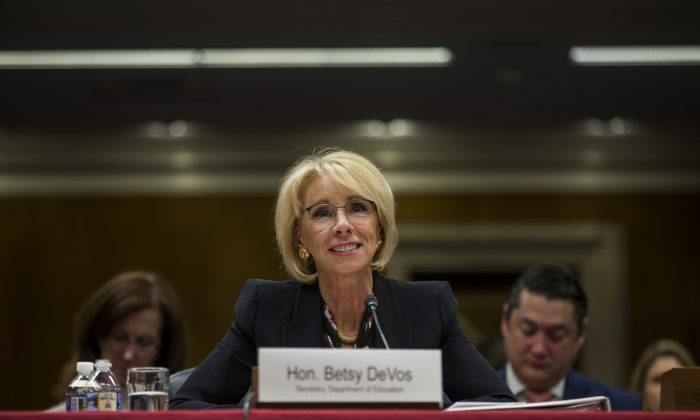 In March, DeVos testified to the House Appropriations Subcommittee on Labor, Health and Human Services on President Donald Trump’s 2020 budget. She said the new budget would increase access to school choice and includes, among other benefits, increased funding for charter schools.